The first freeze in the fall is often a welcome event. I’m ready for the garden to be done, although not everything dies with the first freeze. The lettuce, Swiss chard, and a number of herbs will continue to live until the temperature is consistently below freezing. Of course, the greatest thing about the first freeze is killing off the *&*!! mosquitoes. This picture is from nearly ten years ago in upstate New York. 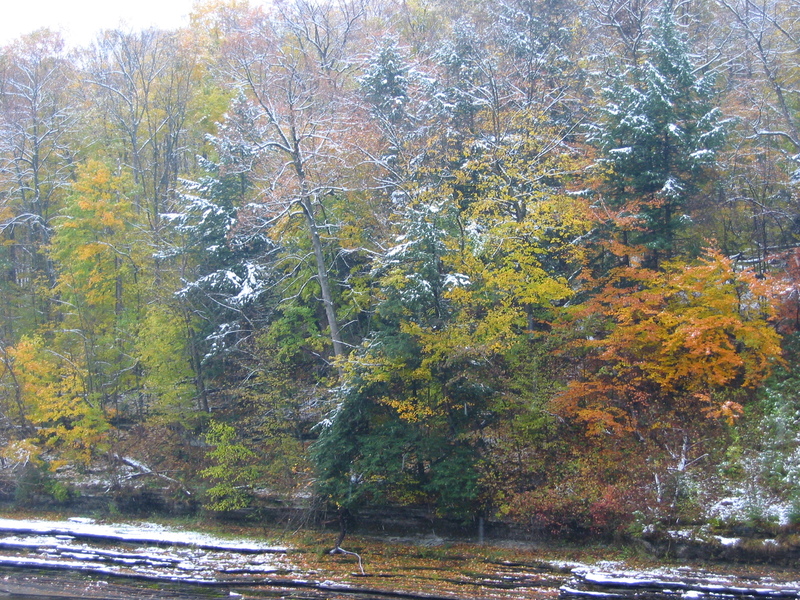 The first freeze was the day of the first snowfall on November 1. My mother was visiting that weekend and was glad she brought her winter coat. Word for tomorrow – SPLIT. If you prefer to work ahead, see the list for the week under “A Word A Day”. Nice to know that Hurricane Irene gave you only a brief power outage. We had power until about 5:30 pm on Sunday. There is no prediction yet on how long it will take crews here to restore power but it is neither too hot or too cold so will make do. The next town has power & I am able to use a public computer at my husband’s former employer (a college) for basic email checks.